I doubt my fellow Americans will be able to get LoveHandles debut in physical except via an expensive import. Nevertheless, in this digital age, I recommend you look for it as download purchase. Quite recommended! 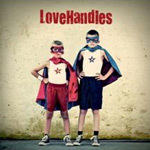 LoveHandles have a keen sense delivering infectious and accessible tunes within a bare knuckle street fighting rock style. I told you they were on too something good.